Stem cells are usually thought of as the building blocks of the body – able to give rise to all our cells and organs. 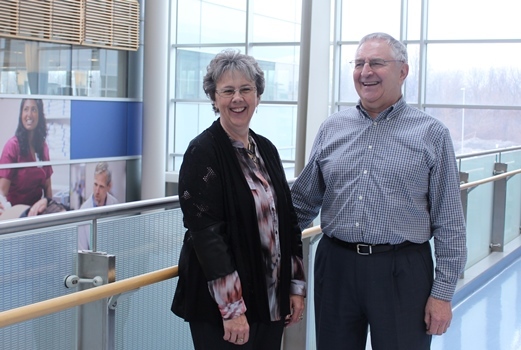 But Dr. Lauralyn McIntyre, Dr. Duncan Stewart, Dr. Dean Fergusson and their colleagues are testing the idea that certain stem cells may also be able to help control the body’s immune system to reduce injury and promote healing, while improving its ability to fight infection. They recently published the results of the world’s first clinical trial of mesenchymal stem cell therapy for septic shock, a life-threatening condition that can occur when an infection spreads throughout the body. The trial involved thirty patients, nine of whom were treated with up to 250 million mesenchymal stem cells. No serious adverse events occurred. A randomized, multi-site trial is expected to start next year, with the power to evaluate benefits as well as risks. Charles Berniqué, a 73-year-old grandfather from Hawkesbury, Ontario, recently survived a deadly infection requiring prolonged intensive care and returned to his family and work after participating in this world-first trial. Berniqué developed an infection in June 2015 after his esophagus burst, possibly due to a severe case of food poisoning. This led to severe septic shock, a deadly condition that occurs when an uncontrolled infection results in hyper-activation of the immune system, causing the cardiovascular system and other organs to fail. Thoracic surgeons at The Ottawa Hospital provided fluid resuscitation, repaired his esophagus and initiated antibiotic therapy. He was placed into a coma in the intensive care unit (ICU), receiving medications, mechanical ventilation and dialysis to support his heart, lungs and kidneys. It was during this time that his wife, Maureen, consented to his participation in the clinical trial. “I just wanted to do whatever I could to help him,” she said. Within 24 hours, Berniqué received an intravenous infusion of 30 million mesenchymal stem cells, grown in a special facility at The Ottawa Hospital. The stem cells were originally extracted from the bone marrow of a healthy Ottawa volunteer. In the end, Berniqué battled back, and despite a number of complications from the massive infection, he slowly recovered. After nearly three months at The Ottawa Hospital, he is now back home in Hawkesbury, spending time with his wife, children and grandchildren and working part-time. See the American Journal of Respiratory and Critical Care Medicine for details. Authors: McIntyre LA, Stewart DJ, Mei SH, Courtman D, Watpool I, Granton J, Marshall J, Dos Santos C, Walley KR, Winston BW, Schlosser K, Fergusson DA; Canadian Critical Care Trials Group and the Canadian Critical Care Translational Biology Group. Funders and partners: The Phase I trial was funded by the Canadian Institutes of Health Research and the Stem Cell Network, with additional support from the community for Regenerative Medicine Research at The Ottawa Hospital. The Stem Cell Network, the Ontario Institute for Regenerative Medicine and the Canadian Institutes of Health Research are providing funding to prepare for the Phase II trial. Other partners include the Canadian Critical Care Trials Group and Canadian Blood Services.